Since we are approaching Superbowl Sunday and Mardi Gras weekend all at once, what better time could you have for making this. I’m sure no one reading this will need a hangover cure, right? But, just in case, it doesn’t hurt to have some of this available for anyone who might need some restoration. I don’t know if it is the briny beef broth, or the egg that does the trick. Do you know that, according to one source, eggs contain two amino acids that go to work to help you feel better: taurine and cysteine. Taurine has been shown in studies to reverse liver damage caused by a night of heavy drinking and to help the body flush out toxins more quickly. Cysteine directly counteracts the effects of acetaldehyde, a nasty by-product of alcohol metabolism that is more toxic than alcohol itself (it causes headaches and chills). Just thought I’d share. 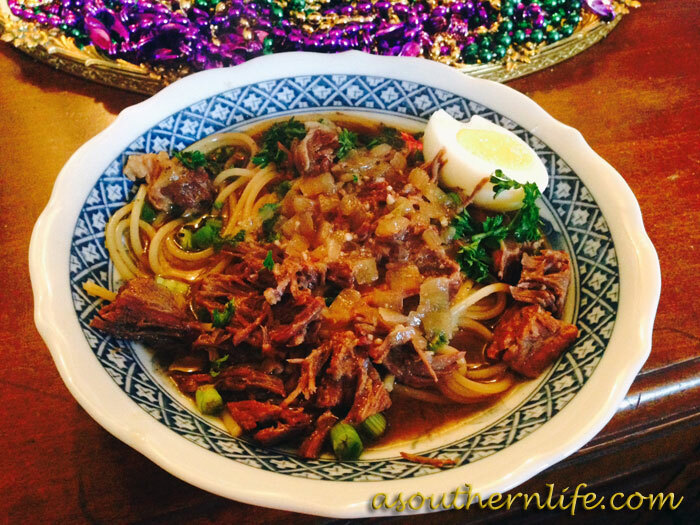 You can find yakamein in New Orleans at festivals, markets and in many restaurants. It is an interesting mix of Asian and Creole flavors that warms you up. Here is the recipe.